Nearly one year after major construction began on the Loop 202 South Mountain Freeway, the state’s largest single project ever, signs of progress abound in the 22-mile corridor. You'll see some this progress (of Salt River bridge construction) in the slideshow above, and many more photos are available on our South Mountain Freeway Flickr page. This progress is good news for Valley motorists, as the South Mountain Freeway is going to bring traffic relief when it opens by late 2019. 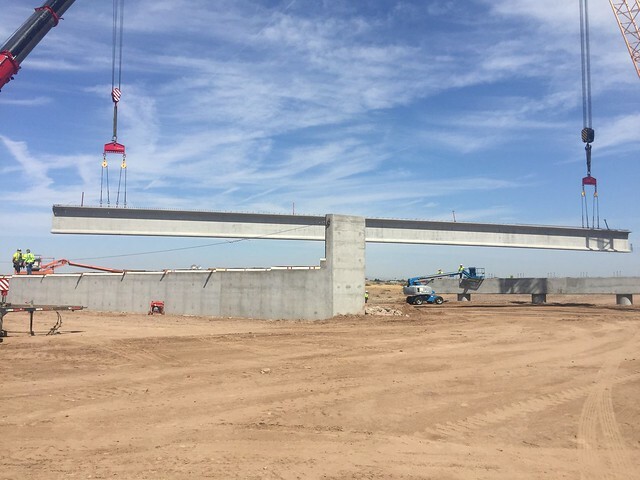 Throughout this year, crews have relocated utilities, started work on bridges, built sound walls and made significant progress on freeway-to-freeway ramps taking shape at Interstate 10 and 59th Avenue in the West Valley. Through the end of November, more than 3.6 million cubic yards of dirt had been moved to build bridge and wall foundations, embankments and connecting ramps. Eight miles of drainage pipe was installed and 5.8 million pounds of reinforced steel planted. That's according to ADOT and Connect 202 Partners, the developer responsible for building the freeway. For more information on the project, visit SouthMountainFreeway.com.